I can’t watch movies like I Am Legend or The Babadook, and if you’re a dog lover who’s seen those films, you know why. I don’t mind when humans die in movies, but it crushes my soul when anything bad happens to the dog. Well, if you’re sick of movies where the pup bites it, I’ve got the solution. I’ve collected some of my favorite action movies where the dog overcomes all the odds and makes it out alive. Maybe the humans do too, or maybe not. I’m not that concerned about it. Check out the trailers if you haven’t seen these. Despite being Doc Brown’s personal test subject, Einstein the dog manages to survive being the first canine time traveler in history after a terrifying 88 mph ride in a scientifically dubious Delorean. The plutonium-fueled car rockets along with the power of one point twenty-one jiggawatts, whatever that means, and disappears into nothingness before reemerging exactly one minute later. We can call Doc Brown a negligent dog owner at best, but seeing Einstein pop out of the frozen car, safe and sound made me happy. Ambrosius is a bit of a coward, but you would be too if you were going into battle against David Bowie, who plays the Goblin King. Ambrosius the Sheepdog is Sir Didymus’s steed, though he doesn’t share his rider’s desire to charge into battle. Seeing as Sir Didymus looks a bit like a Fox Terrier, himself, it seems odd that he would ride another dog. That would be like a human riding a gorilla into battle, which sounds pretty cool, actually. Ambrosius manages to stay clear of danger throughout the adventure, mostly by running away. We’d run away if we saw some of the creepy muppets from his world, too. Eisenhower is Captain Stars and Stripes’s faithful German Shepherd, trained to attack the more sensitive areas of enemies’ bodies. But even though he’s a tough pooch, he looks very cute in his superhero costume. In this hyper-violent movie where lots of people die, Eisenhower gets out unharmed, trying to defend his owner. In fact, when a bad guys asks if he should kill the dog, his leader says, “I’m not that evil.” What a relief! 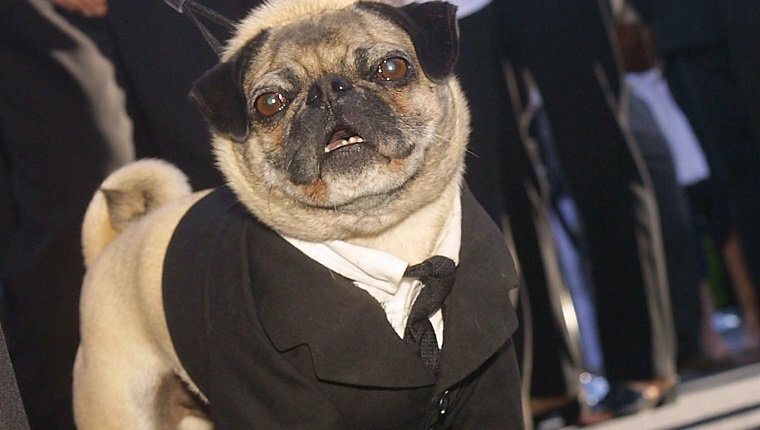 Frank the Pug isn’t exactly a dog. He’s an alien who disguises himself as a dog. But he still needs to go for a walk, and he’s not fond of cats, so maybe he’s kinda sorta like a dog? He gets a little shaken up by Agent K, but like I said, he’s not a real dog…I think. He makes it out of the movie just fine, and even gets a bigger role as a full-fledged Agent in the sequel. He’s a bit of a smart aleck and has a grating personality, but we love him anyway. Will Frank make an appearance in the new Men In Black International movie? We’ll have to wait and see! Kim Jong-un the Cavalier puppy is a lot sweeter than the dictator who presents the pooch to reporter Dave Skylark in this film. James Franco’s character names the pup in honor of the North Korean leader who gave the dog as a gift in an attempt to distract him from investigating the human rights violations of the tyrant’s regime. In Dave’s arms, the little pup escapes a military compound, goes for a ride in a tank, and flees across one of the most guarded borders in the world. He doesn’t seem too scared of all the madness and bullets flying around his head, and his cuteness shines like a firework. Boomer the dog doesn’t just make it out of this film alive; he becomes an action star all by himself. Aliens are attacking and blowing up pretty much everything on the planet. At one point, Boomer’s owner and her son flee a fiery explosion in a tunnel and hide in a small alcove as the flames are advancing on them. At the last second, Boomer makes a heroic jump, just as the inferno engulfs the cars behind him, safely landing next to his humans. He also gets an action shot that even Will Smith would be jealous of. What movies do you love where the dog gets out alive? Did I miss your favorite? Let me know in the comments below!